We use modern strip planking techniques in building all of our boats because it produces a beautifully crafted and structurally very sound product. 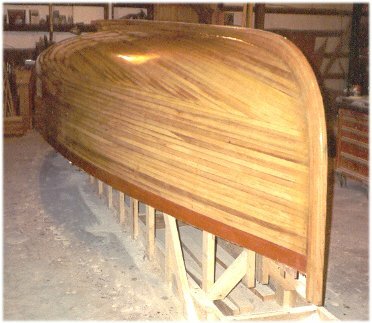 Strip planking is a development of traditional carvel construction where the hull is planked with narrow, edge-fastened strips of timber bonded together along the edges with a modern wood epoxy system (we use System Three epoxies). We typically use tulip poplar as our strip planking wood because it has a high strength to weight ratio. The strips are usually about 1" wide and between 1/2" to 3/4" thick. The size of the boat and the shape of the hull govern strip size. The strips should be narrow enough to bend around the curves in the hull, but thick enough to give the hull adequate strength. So as you can imagine, there are very few limitations on hull size and shape with strip planking. The planking process first entails creating a "mould", a series of closely spaced boards that when taken together defines the shape of the hull. The mould sections are erected upside down on a framework that holds them in place. First, the keel is laid down through the center of the mould. This consists of thick strips of oak built layer upon layer to form the backbone of the boat. Next, the sheer line is created by applying an oak board (usually) around the outside perimeter of the mould to form what will be the top edge of the hull once it is right-side up. 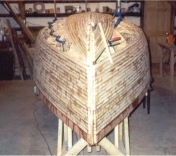 Then strips of wood (usually poplar or cedar) are applied to the outside of the mould one at a time from the sheer line up toward the keel of the boat, each one being nailed with bronze nails and glued with epoxy edge to edge with the strip next to it until the entire structure is covered and the shape of the hull comes to life. 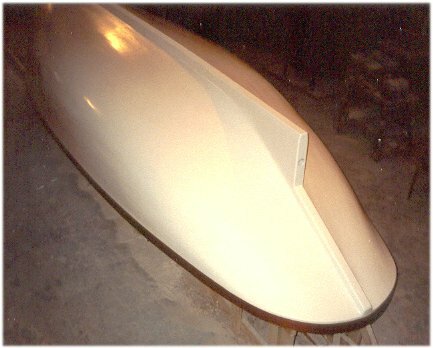 The resulting hull is sanded smooth and then further strengthened by adding one or more layers of fiberglass cloth epoxied to the outside and, usually, the inside also. The fiberglass cloth "disappears" when it is bathed in epoxy. The result is, in effect, a sandwich panelthat is, the wood is a stiff core between two hard stretches of reinforced epoxy plastic. The fiberglass adds structural integrity to the hull and also adds a layer of protection to the wood underneath so that the wood is not so easily dented and scratched. Additional internal hull structures such as bulkheads, benches, and floors also contribute to the overall strength and integrity of the hull. Next, the boat is painted (usually only the outside so the inside is left as natural as possible). Bottom paint may be applied if the boat will be left in the water for extended periods of time, or regular paint may be used if the boat will be trailered between uses. Once the strip planking and painting is complete, the hull is turned right-side up with a hoist and set on a boat trailer for final finishing. The hull will be complete with the installation of a deck, cap rails, rub rails, deck hardware, a bow eye, and internal structures such as seats, engine bed, etc. And then, of course, the steam boiler, engine and fittings are installed, followed by any final outfitting that is desired such as a canopy, seat cushions, etc. Then, the boat is ready for its first trial run.